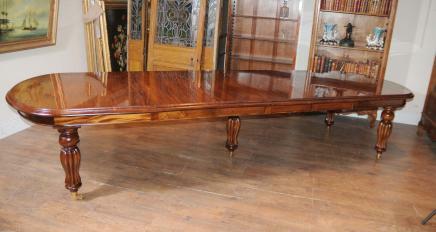 You are viewing a gorgeous five foot English George Bullock style octagonal dining table. I hope the photos do this stunning piece some justice, it’s certainly better in the flesh and would surely be the talking point to any home interiors scheme. 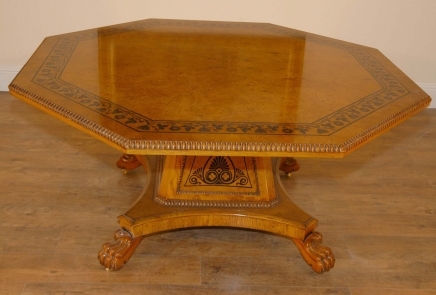 The table has been hand crafted from walnut with some lovely hand carved details, including the egg and dart perimeter and the chunky lions paw feet. 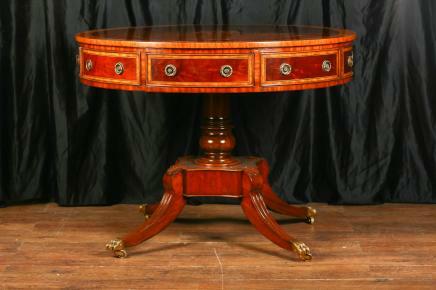 The table also features some lovely black inlay work showing flowers, scrolls and garlands to the perimeter and base. 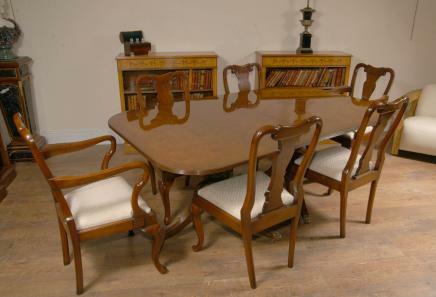 The table is solid and chunky and offered in perfect condition ready for home use right away. It will serve you for generations of use, hence making it a great heirloom. We bought this from a dealer in Barnet, North London. 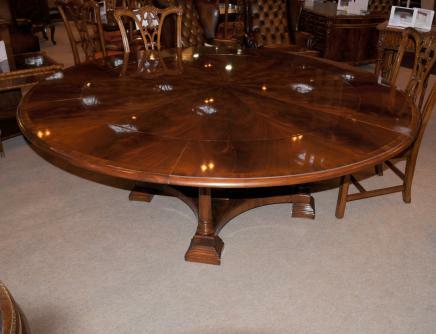 The table measures five feet across and this sits six people perfectly, great for an intimate dining experience as offered by a round table. We have various sets of chairs available to match so please contact us. Please email if you are interested or check out store page, this is the ultimate dining set and we would offer a great discount for buying chairs and table. – Come and view this in our Hertfordshire warehouse yourself!